How long is a standard NYC rental agreement for landlords looking to rent out their property? How does the lease agreement language differ for “no fee” versus normal listings where the tenant pays the broker fee? Who normally pays the broker fee for rentals in NYC? The broker fee is paid by the tenant in the vast majority of rental transactions simply because of the supply and demand dynamics of the NYC rental market. There is normally such a high demand for non-luxury rental housing stock that landlords can get away with never paying the broker fee. Listing brokers thus are able to list the landlord’s property for free and charge the tenant typically 15% of annual rent in fees. This fee is often split 50/50 between the tenant’s broker and the listing broker if the tenant is represented. 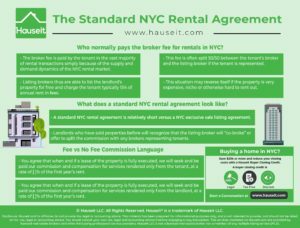 What does a standard NYC rental agreement look like? As a landlord, you’ll notice that a standard NYC rental agreement is relatively short versus a standard Exclusive Right to Sell Listing Agreement. If a landlord wishes to advertise the property as “no fee,” the commission language in Part 6 of the sample NYC rental agreement below simply needs to be changed to “You agree that when and if a lease of the property is fully executed, we will seek and be paid our commission and compensation for services rendered only from the landlord, at a rate of [__]% of the first year’s rent.” Landlords who have sold properties before will recognize that the listing broker will “co-broke” or offer to split the commission with any brokers representing tenants. 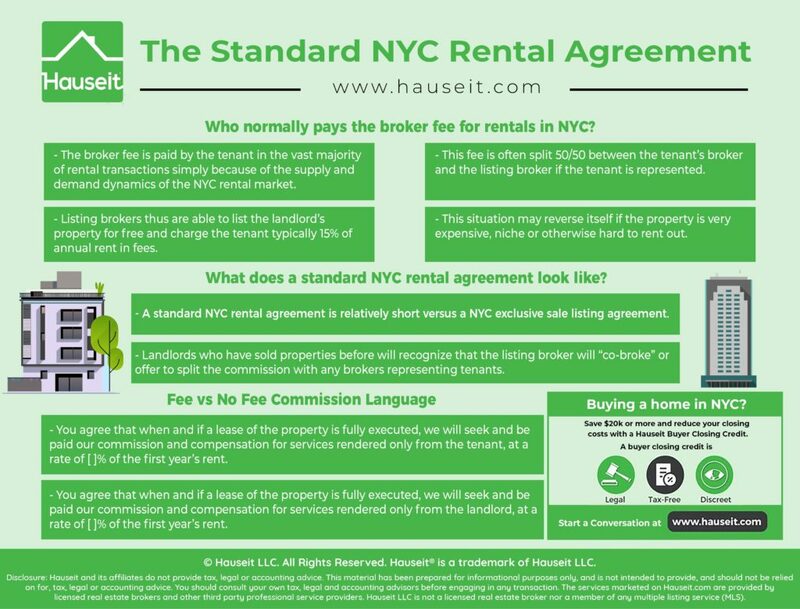 We’ve included a sample standard NYC rental agreement below where the tenant will pay the broker’s fee. This will confirm that you have engaged [Brokerage Name] (“Broker”) as your exclusive agent with the exclusive agency to lease (including sublease) the above Premises. ___ You are the owner of the Premises and authorized to rent the Premises without the consent of any other person. ___ You are the tenant of the Premises, have received approval from the Owner of the building to sublease or assign your lease and will cooperate with Broker and any prospective tenant in obtaining the con sent of the Owner. ___ The Premises is a condominium unit, you are the owner, and you will cooperate with Broker and any prospective tenant in obtaining the Waiver of Right of First Refusal of the Condominium. ___ The Premises is a cooperative unit, you are the holder of the proprietary lease for the Premises, and you will cooperate with Broker and any prospective tenant in obtaining the consent of the Cooperative. Any rental or sale is subject to approval of the Landlord, Condominium, or Cooperative, as applicable, as well as your approval. You authorize Broker to contact the foregoing, or their managing agents, to verify the status of the Premises and all necessary approvals. 2. You authorize Broker to offer the Premises at a monthly rent of $[ ] for a term of [ ] years, commencing on or about [ ]. 3. The Term of this Exclusive Agency shall be [ ] months from the date you sign this Agreement. Thereafter the Term may be extended by mutual agreement of the parties, in writing or it shall become an open listing. 4. You authorize Broker to advertise, photograph and show the Premises. Broker may host open houses for potential tenants and brokers. You authorize Broker to direct all marketing and agree that no other advertising or marketing, including listings on the Internet, shall be permitted unless Broker specifically authorizes them. Broker will advertise the Premises, including listing it on its web site, at its discretion. Broker’s agent [ ] will report activity to you on a regular basis and will accompany all potential tenants and co-brokers at the Premises. 5. You hereby authorize Broker, unless otherwise specified by you in this Agreement, to solicit, beginning 72 hours from the time we receive your acceptance of this Agreement, the cooperation of other licensed real estate brokers who are members of The Real Estate Board of New York who will act as agents for the prospective tenants. 6. An Exclusive Agency to Lease means that during the Term of this Agreement only you and the Broker can rent the Premises. 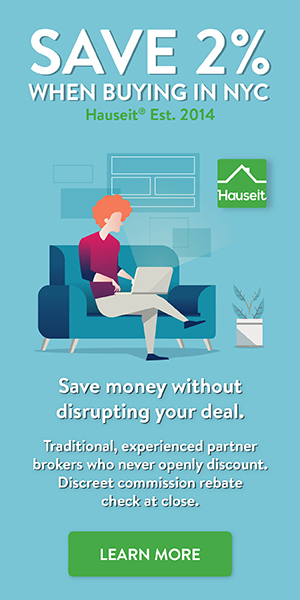 During the Term of this Agreement you agree to refer to Broker all inquiries, proposals and offers received by you from other brokers, and you agree to conduct all such negotiations solely and exclusively through Broker. Nothing in this Agreement shall preclude you from leasing the Premises on your own. You agree that when and if a lease of the property is fully executed, we will seek and be paid our commission and compensation for services rendered only from the tenant, at a rate of [ ]% of the first year’s rent. 7. If the Premises is sold during the Term of this Agreement, or if a tenant procured by Broker, or such tenant’s affiliate, enters into a sales contract to purchase the Premises within 6 months after the expiration of the lease term or extension thereof you agree to pay Broker a commission of [ ]% of the sales price, payable in full at closing of title. If you retain a purchase deposit, you agree to pay Broker a commission of [ ]% of the amount retained. This provision shall survive termination of this Agreement. 8. Within three (3) business days after the expiration or termination of this Agreement, Broker will give you a list of no more than 6 people who were introduced to the Premises by Broker during the Term. If a lease or contract of sale for the Premises is entered into with anyone on that list within 90 days of the Term, you will owe us a commission as provided in this Agreement. 9. You acknowledge that Broker has informed you of your obligations under the Federal Lead Paint Disclosure Law and that you are aware of your responsibility to ensure compliance therewith. 10. This Agreement represents and embodies the entire agreement between the parties and supersedes any previous oral or written agreements, discussions or understandings. This Agreement may only be amended or modified by a written document signed by the parties. This Agreement is binding upon both parties’ successors and assigns. Please sign below as confirmation of your agreement, retain a copy, and return a signed copy to Broker.